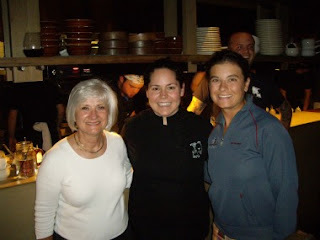 If Stephanie Izard (middle) is expediting, she'll break for photos. The foodie in me comes out around marathon time. The parents are in town (hello meals my wallet can’t afford), my stomach is screaming out for food and lots of it after running 26.2 miles (as long as I don’t drink too much Gatorade on the course), and well, I never would have majored in journalism if I hadn’t thought that my post-college dream was to become a food critic (picture Julia Roberts’ character in My Best Friend’s Wedding and you had my 18-year-old self’s grand aspirations). And I feel like I need to set the record straight on places to eat when you’re in the Windy City after reading another runner’s list last year—one, I might add, that Runner’s World caught wind of and posted somewhere in the depths of social media. The list wasn’t bad, per say, it’s just that there are better choices—or my choices—and they’re different. And more must-eats-when-in-the-Windy-City. And not deemed go-to’s by a site that’s based out of Albuquerque (in defense, the list was compiled by a traveling runner--and Chicago 2010 participant--and gastronut). Coming to Chicago to run the Bank of America Chicago Marathon? Check out these 26.2 eats when you’re in town—or save them for your next, non-running trip. Unless you reserved this one right around the time you signed up to run the marathon, you’re going to have to reserve now for the next time you plan to be in town. This Top Chef (Stephanie Izard) hot spot has a two-month long wait list for most nights in the near future—I tried weeks ago to reserve on Opentable and couldn’t get in until November. But the cuisine? Soooo worth the wait, even for this barely-eats-meat girl who’ll take bikes of the pig face any day. Oh Art Smith, what would we do to dine at your Chicago restaurant (and not because I can walk there from my house). Your hummingbird pie, your hot-out-of-the-oven biscuits to start off the meal, your deviled eggs that I’ll only eat out of your kitchen, your mac n cheese that’s so rich I can’t take more than a bite, your pleasant surprises on the menu—the fish special that I think I eat every time because not one sounds worthy of skipping for fried chicken. If you need to carbo load, go here. It’s close to the start line and the food is pretty darn good. And with three restaurant choices within—La Cantina, Vivere and The Village—you can opt in or out of fancy fine dining. Maybe I’m being scene-y but this place is red hot at the moment (packed on a Tuesday night after 9 p.m., come on). The food delivers too, and if you go with a group, you can sample nearly everything on the menu. How could I omit Rick Bayless? Here’s a chef that screams Chicago—the man is everywhere I tell you, including theater—and creates to-die-for food. The only problem? It’s hard to choose just one between the Bayless creations. Frontera Grill doesn’t take reservations so if you want to stand in line, you’ll have just as good a chance of getting in as any other. Or if you’re thinking lunch, light dinner or cheaper eats (and these are complete generalizations), walk around the corner to XOCO where you’ll get Bayless’s sandwich creations that are hearty, inventive and leave you begging for another visit. With eight locations around the city, you’ll be able to get into at least one of them with relative ease and while you get your pasta fix, your dining buddies can opt for steak, Italian or some killer salads. Don’t want to venture far from the start line? This gastropub is right there. It might not be the place to dine before the race, unless your stomach wants an adventure (poutine with elk, rabbit salad) or fried goodness (scotch egg, fish and chips). But when your brain is thinking beer post-race, you may as well have a good meal with it. Vegetarians, this one is totally for you. But even carnivores won’t miss their meat at this Shawn McClain spot (my dad and my husband approve, both have been—and more than once). The menu changes with the seasons and leaves you full on antioxidants and phytochemicals. Or if that’s already full, after all it’s a Friday or Saturday night you’ll be shooting for and they’re closed on Sundays, consider the Chicago Diner. Though nowhere near as upscale, you won’t find any meat on premises. OK so maybe it’s a little touristy, but it’s off the beaten path enough that you’ll still find locals. And the Weber Grill HQ is in Illinois so you’re getting something authentic, and down right cool: everything on the menu (minus a couple of obvious items) is cooked on massive charcoal grills in the kitchen. You can’t miss them. With Grant Achatz’s newest project Next being the talk of the town (or the country), the hype may have calmed down a little (hey, one can dream) at his first must-experience-this spot. I have yet to go but from what I’ve read, heard and seen (ahem, an always booked Opentable account), it’s got to be good. So it’s not actually representative of Pilsen but it is located in the neighborhood. And I haven’t heard a bad review yet. Can you say designed for endurance athletes? Protein Bar doesn’t segregate by any means, but it does make you rethink lunch and dinner when you’re about to cave and go greasy, fried or calorie-laden. Menu items under 500 calories, protein-packed and registered dietician approved, you won’t have to worry about where you’ll find your quinoa when you don’t have a kitchen to whip up your own. Being that this list is already a lot to read, I'll take the only logical route in my running mind, break at halfway. Or in this case, I'm leaving you at the Protein Bar location that's near the Willis Tower, just shy of the happy halfway mark along the course, with the other 13.2 to follow. Stay tuned for the back half, but in the meantime check out three sites that I often peruse for Chicago food news: Eater Chicago, Elizabites and Time Out Chicago.